Please note: There will be no ARRL Audio News on Thursday, May 17. The ARRL Letter will be sent out on its regular schedule that day. The ARRL EXPO -- located in the Ballarena Hall (near the 400-numbered booths) will include more than 20 exhibits staffed by ARRL volunteers officers and staff. When the ARRL EXPO comes to the Dayton Hamvention® May 18-20, it will bring activities for almost every Amateur Radio activity under the Sun. From radiosport to card checking to scouting to the Youth Lounge, every radio amateur will definitely find something to suit his or her interests. This year -- in addition to our popular kit building station -- watch how "makers" and "hackers" are using Amateur Radio in "Do It Yourself" projects on the DIY Stage in the ARRL EXPO, and hear from hams who are doing-it-themselves. Today's Amateur Radio innovators will demonstrate a variety of creative projects and cool technology right before your eyes! Read more here. The FCC released a Notice of Proposed Rulemaking on May 4, seeking to raise the fee for Amateur Radio vanity call signs. Currently, a vanity call sign costs $14.20 and is good for 10 years; the new fee, if the FCC plan goes through, will go up to $15 for 10 years, an increase of 80 cents. 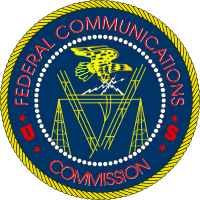 The FCC is authorized by the Communications Act of 1934 (as amended) to collect vanity call sign fees to recover the costs associated with that program. Read more here. Jessica Rosenworcel, a Democrat, and Ajit Pai, a Republican, were confirmed as FCC Commissioners by the US Senate. They are expected to be sworn into office in the next few days. Six months after President Barack Obama nominated Jessica Rosenworcel and Ajit Varadaraj Pai to the Federal Communications Commission, the Senate confirmed their appointments on Monday, May 7. Rosenworcel, a Democrat, fills the seat vacated by Michael Copps who retired from the Commission earlier this year; her term runs through June 30, 2015. Pai, a Republican, replaces Meredith Attwell Baker, who left the FCC in June 2010; his term runs through June 30, 2016. Once Rosenworcel and Pai are sworn in, the FCC will be at its full complement of five Commissioners. According to various reports, the two will be sworn in by the end of this week. Their nominations had been held up since December in an unrelated dispute between the FCC and Senator Chuck Grassley (R-Iowa) over agency approval of LightSquared's wireless application. When Grassley received the sought-after documents two weeks ago, he lifted a hold on the nominations. Read more here. For the second time since 1992, Heathkit Educational Services has shuttered its doors. Rumors of the legendary kit-building company's demise were posted on QRZ.com, with several readers bringing the news to the attention of the ARRL. In August 2011, Heathkit announced it was returning to the kit building business, and in September, that it would once again be manufacturing Amateur Radio kits. The ARRL tried to reach Heathkit to confirm that the company is still in business, but their phone and fax numbers have a continuous busy signal, and e-mails to the company have gone unanswered. Read more here. NASA will televise the launch and docking of the next mission to the International Space Station (ISS), scheduled for May 14. NASA Flight Engineer Joseph Acaba, KE5DAR, and his two Russian crewmates, Soyuz Commander Gennady Padalka, RN3DT, and Flight Engineer Sergei Revin, RN3BS, are completing their training as they undergo Soyuz spacecraft fit. Live NASA TV coverage of the Soyuz TMA-04M spacecraft launch from the Baikonur Cosmodrome in Kazakhstan begins at 9 PM CDT on Monday, May 14 (0200 UTC May 15), with the launch scheduled for 10:01 PM CDT (0301 UTC). The trio will arrive at the station May 16, joining Expedition 31 Commander Oleg Kononenko, RN3DX, of the Russian Federal Space Agency, Flight Engineer Don Pettit, KD5MDT, of NASA and Flight Engineer Andrei Kuipers, PI9ISS, of the European Space Agency, who have been aboard the ISS since December 2011. 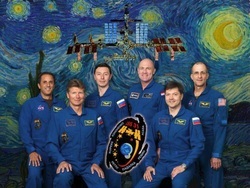 Padalka, Acaba and Revin will transition to the Expedition 32 crew in July and return to Earth in mid-September. You can watch live online on the NASA TV Public and Media channels, or on your television set. Contact your local provider for the NASA TV channel in your area. Click here for a complete schedule of televised events. Scouts and Scouters can earn the new Morse code interpreter strip by completing all three requirements: Carrying on a five minute conversation in Morse code at a speed of at least five words per minute, correctly copying a two minute message sent in Morse code at a minimum of five words per minute (copying means writing the message down as it is received) and sending a 25 word written document in Morse code at a minimum of five words per minute. For many years, Boy Scouts and Scouters have been able to earn an interpreter strip to wear on their uniforms. This strip -- worn on the uniform above the right pocket -- denotes proficiency in a foreign language or sign language. Each language has its own strip (with the name of the language embroidered in that language), and some Scouts and Scouters wear more than one strip. Now those hams involved with the Boy Scouts can show their proficiency in Morse code with a Morse code interpreter strip (with M-O-R-S-E spelled out in Morse code). Read more here. The US Coast Guard will be joining the Army, Air Force, Navy and Marines in the 2012 Armed Forces Crossband Test, scheduled for May 12. In addition to the Coast Guard station, five Army stations, three Air Force stations and six Navy/Marine Corps stations will be on the air to celebrate the 62nd anniversary of Armed Forces Day. Read more here. The Sun, as seen on Thursday, May 10, 2012 from NASA's SOHO Extreme Ultraviolet Imaging Telescope. This MDI (Michelson Doppler Imager) image was taken in the continuum near the Ni I 6768 Angstrom line. The most prominent features are the sunspots. This is very much how the Sun looks in the visible range of the spectrum. 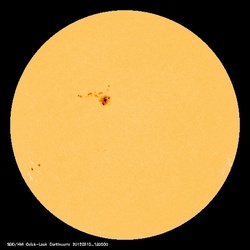 Tad "Flashing and frolicsome under the Sun" Cook, K7RA, reports: The average daily solar flux for the past week rose slightly, 116.2 to 119, but the average daily sunspot numbers declined more than 14 points -- about 13 percent -- to 92.6. The predicted solar flux for the near term is quite a bit higher than the average for the past week: Solar flux on May 10-13 is 130, then 135 on May 14-17, and then it drops sharply to 110 on May 18-22, 115 on May 23-25, 110 on May 26, and then down to 105 on May 27-31. The predicted planetary A index is 22, 15, 10, 8 and 5 on May 10-14, 8 on May 15-16, 5 on May 17-18, 8 and 10 on May 19-20, 15 on May 21-23, 8 on May 24, and 5 on May 25-June 4. The predicted planetary A index of 22 on May 10 looks like a continuation of activity from May 9, which resulted in a planetary A index of 24 and a mid-latitude A index of 19. This was triggered by a pair of coronal mass ejections and solar wind stream, all from sunspot group 1476, which is now swinging into prime geo-effective position. This means it is very close to the center of the visible solar disk, pointing emissions straight toward Earth. It could be the source for more geomagnetic upset. Look for more on the ARRL website on Friday, May 11. For more information concerning radio propagation, visit the ARRL Technical Information Service Propagation page. This week's "Tad Cookism" is brought to you by Ralph Vaughan Williams' Sea Symphony (III Scherzo The Waves), taken from Walt Whitman's Leaves of Grass (Book XIX, After the Sea-Ship). ARRL DXCC Manager Bill Moore, NC1L, reports that the current 7O6T DXpedition to Yemen and the February 2012 6O3A DXpedition to Somalia have been approved for DXCC credit. "If you had cards that were recently rejected for the 6O3A operation, please send an e-mail to the ARRL DXCC Desk," Moore said. "Please note that due to extremely heavy e-mail, DXCC staff may not respond to your message. Once your record is updated, results will appear in Logbook of The World (LoTW) accounts or in the live, daily DX standings. Due to a backup on DXCC e-mail, DXCC staff will make the corrections to accounts, but may not respond directly to messages about this."